Ontarians will get a “patient advocate” to help them when the health care system has stumbled and personal support workers — who aid the ill and seniors — can expect better wages, Health Minister Deb Matthews said Monday. “When PSWs tell me they can make more at Tim Hortons, I sit up and take notice,” Matthews said after a luncheon speech to the Empire Club of Canada. But she warned it will take time to implement both plans, particularly more help for personal support workers, experience a 60 per cent turnover rate as they look for jobs that pay more. The minimum wage for personal support workers is $12.50 an hour — more than the provincial minimum wage of $10.25 hourly — and that has not changed for several years, Matthews said, calling PSWs the “angels” of the health care system and suggesting consultations will be held with agencies employing them. 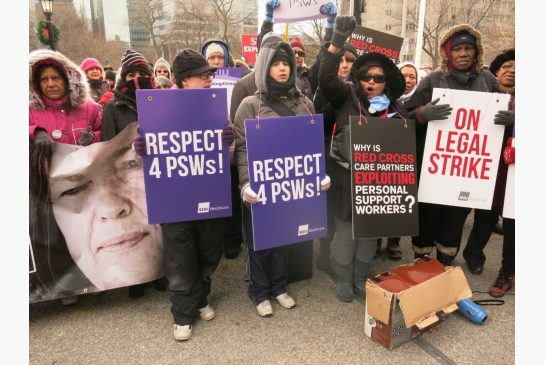 PSWs protested for better treatment at Queen’s Park late last year. Personal support workers have complained they are treated like cheap labour for doing a valuable job in the home care system, helping to keep people out of hospitals or nursing homes and saving taxpayers money. This would be in addition to complaint processes at local hospitals, for example, Matthews said, promising to consult with health care providers on how to structure the office. The move comes after years of pressure from Ontario Ombudsman Andre Marin for power to investigate hospitals. Matthews said the health ministry is also working with family doctors to make more same-day and next-day appointments available for patients when they become ill and need treatment — a category of health care proficiency in which Canada lags other countries. “If people don’t get that access they’ll go to emergency rooms,” Matthews said. Family doctors are being encouraged to leave space every day in their appointment books for patients needing help on short notice, she added.